Previously, we introduced you to the Life Care and Modified contracts available at Fountaingate Gardens. Now, we are excited to announce a new contract option available for a limited number of new depositors. In this series, we respond to questions posed to us by the members of our community. If you’d like us to answer your question, email it to egrant@gurwin.org. At our most recent “Ask the Experts” event, we featured a panel of future Fountaingate Gardens residents: Bonnie, Ina, Joyce and Al. Our discussion covered a range of topics, including why these depositors chose to make the proactive decision to make their future at a Life Plan Community* like Fountaingate Gardens. This group of future Fountaingate Gardens residents, alongside our expert staff, also had particularly insightful comments about involving your family in the decision, making the transition to senior living and factoring in the financial aspects. Just as our upscale residences will surround you in comfort, our welcoming main lobby will have a bright, airy feel that extends the feeling of home. 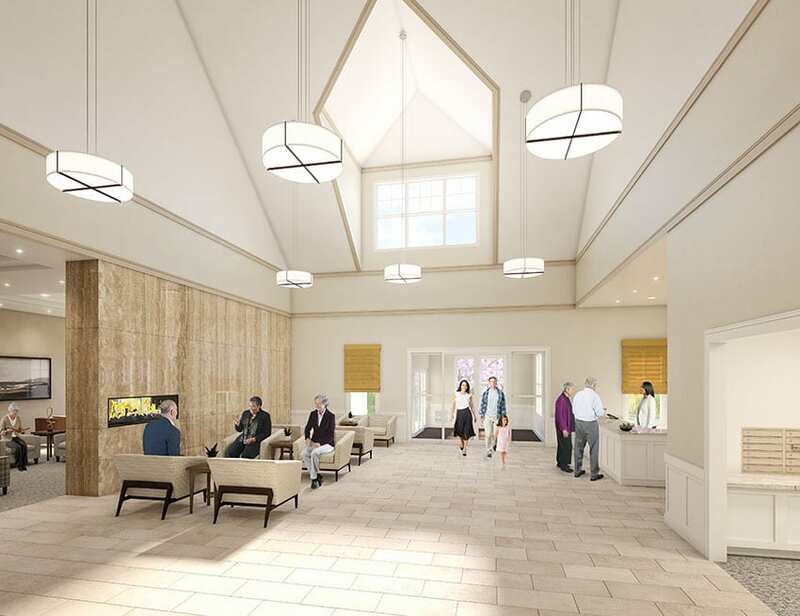 Our lobby will be much more than just a place to gather and greet friends, as you will see in our new rendering. It will be the hub of some of the community’s best conveniences. To the Point: Is Fountaingate Gardens a Good Financial Decision? In this series, we respond to questions posed to us by members of our community. If you’d like us to answer your question, email it to egrant@gurwin.org. At our most recent “Ask the Experts” event, we featured a panel of future residents: Bonnie, Ina, Joyce and Al. Our discussion covered a range of topics, including why these depositors chose to make the proactive decision to make their future at a Life Plan Community* like Fountaingate Gardens. 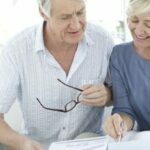 This group of Founder’s Club members, alongside our expert staff, also had particularly insightful comments about involving family members in the decision, making the transition to senior living and factoring in the financial aspects. Meet Fountaingate Gardens Founders Club Member, Ina Rubin! 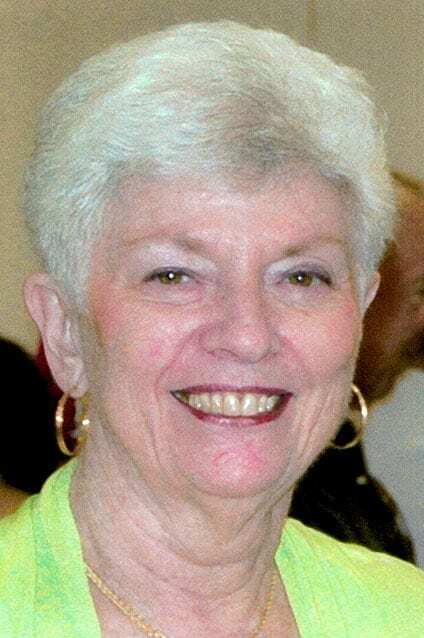 An enthusiastic supporter of Life Plan Communities in general—and Fountaingate Gardens in particular—Ina couldn’t wait to make a deposit, choose her future home and become a member of the Founders Club. Each time you enter the Azalea residence, you’ll have a choice to make. Do you head to the right and enjoy the spacious, contemporary comfort of one of the two bedrooms and two full bathrooms? Or, do you head to the left and spend quality time in the contemporary kitchen and sun-filled living area? Regardless of where you decide to spend your time inside the Azalea residence, this customizable home in The Terraces at Fountaingate Gardens welcomes you with top-quality finishes and an even 1,400 square feet of usable, luxurious space. 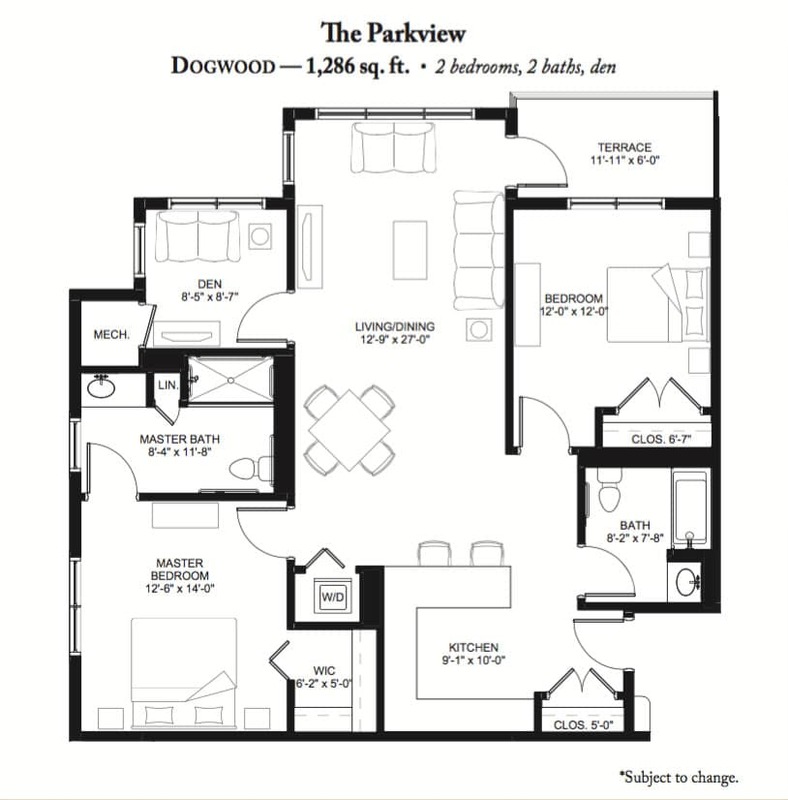 Within the Parkview building at Fountaingate Gardens, the Dogwood residence offers a robust amount of space with the features and comforts of a modern luxury home. 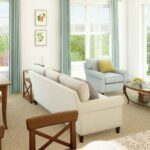 Two bedrooms, two full bathrooms, a versatile den, a spacious terrace and a dozen windows make the Dogwood a sun-filled spot for spirited senior living. As you start your day in the Dogwood, natural light warms the spacious master suite, and the comfortable master bathroom makes it a joy to get ready to take on the day at Fountaingate Gardens. The master bathroom features high-end fixtures and plenty of natural light from its large window. One of the highlights of the master suite at the Dogwood is the huge walk-in closet, with space to store clothes for every season and style! If your day calls for entertaining, as soon as you exit the master suite, the contemporary kitchen awaits you with plenty of space and all the appliances to suit any taste, from a simple lunch to a fabulous dinner party. Modern cabinets and countertops create an inviting, sophisticated look, while the integrated bar-style peninsula offers room for conversation. When it’s time to dine and delight your guests, you will enjoy a generously sized living and dining area that is connected to the kitchen, directly in the center of the Dogwood. All you’ll need to do is bring your favorite furniture and let the room come together as the hub of your new, refreshing home. Opposite from the master suite and also attached to the living area are the second bedroom and second bathroom. This layout makes it easy to host guests, whether they are staying for the night, or for just an hour. In the Dogwood residence, guests can feel right at home with all the space and comforts available, making it an enjoyable stay for all. The Dogwood residence at Fountaingate Gardens also offers a flexible den space, which can serve as an office, home theater, library or hobby room. The windows in the den allow the sunlight to fill the space, and they also make it a great spot to sit and enjoy the views of the beautifully landscaped campus. And, if you want to really experience the Long Island seasons from the comfort of your own home, the outdoor terrace connected to the Dogwood’s living area is the perfect spot to do so! While living at Fountaingate Gardens, you’ll not only enjoy the time spent in your spacious, customizable residence, but you’ll also love all the possibilities for activity both on and off campus in Commack. 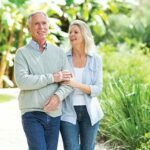 Additionally, all of those opportunities for action and exploration exist in concert with the benefits of living at a Life Plan Community* backed by Gurwin, with a reputation of excellence and added security should your health needs ever change. At Fountaingate Gardens, you’ll be able to expand your “today” while having all the stability you could ever need for your “tomorrow” – no matter which residence you choose. For more information on the Dogwood residence, call Fountaingate Gardens today at (631) 715-2693, or visit us online to request a personal appointment! When construction is complete at Fountaingate Gardens, the community will include two elegant building styles, the Terraces and the Parkview. Within those buildings and their 16 combined floor plans, the beautiful residences will not only include modern conveniences and appliances, but also your unique style. How can I make my Fountaingate Gardens home reflect my style?